filled with a tapestry of textures including fragrant thyme. Fisher residence, Woodinville, WA. Design by Artegos Designs. Sitting in the garden is one of my favorite pastimes, although admittedly one that I rarely seem to manage with all the landscape renovations in progress. Yet it is these contemplative, restful moments with friends or alone that enable me to appreciate the surrounding sights and sounds of the garden. Decks, balconies or even a grassy nook can serve in this way yet patios may offer the greatest flexibility in terms of materials, size, shape and style. As I have had the opportunity to visit and photograph many gardens I have been inspired by the creativity of others and thought I would share some of these ideas with you. Gravel is undoubtedly the cheapest option with crunchy pea gravel, decomposed granite or compacted rockdust all being options. Where a landscape project needs to be completed in phases the latter can serve not just as an interim patio but also as base for stone to be installed later. Concrete pavers are available in many colors, finishes, sizes and shapes from small cobblestones to large squares. Several companies offer kits for interlocking cobblestone pavers making more elaborate patio designs within easy reach of the DIY homeowner. 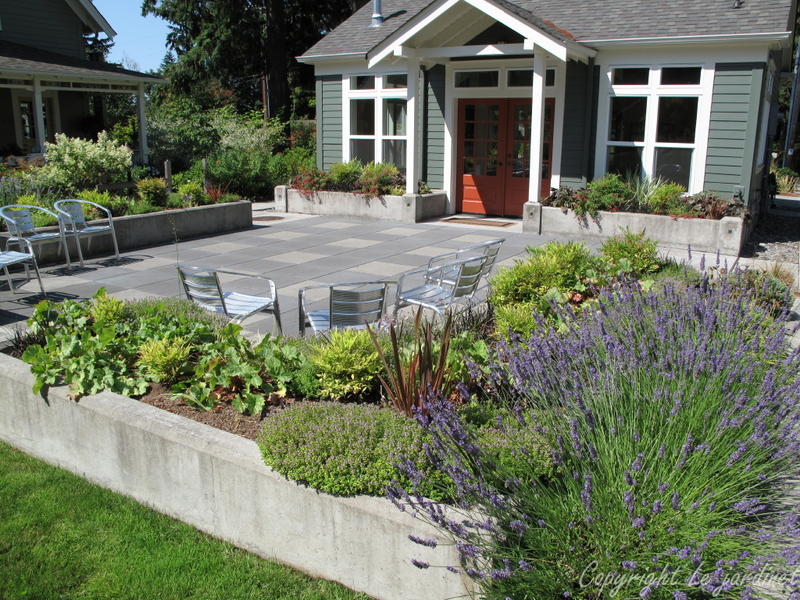 Hydrapressed concrete pavers are an option which offers exceptional durability and strength. Poured concrete slab is functional if perhaps not always the most attractive choice but with the options now for custom coloring and stamping it is possible to achieve the look of stone pavers and flagstone at a fraction of the cost. 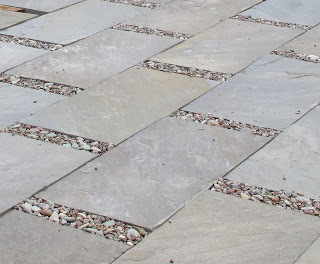 Flagstones are irregularly shaped natural stones, often split using the natural clefts so the surface is somewhat even. 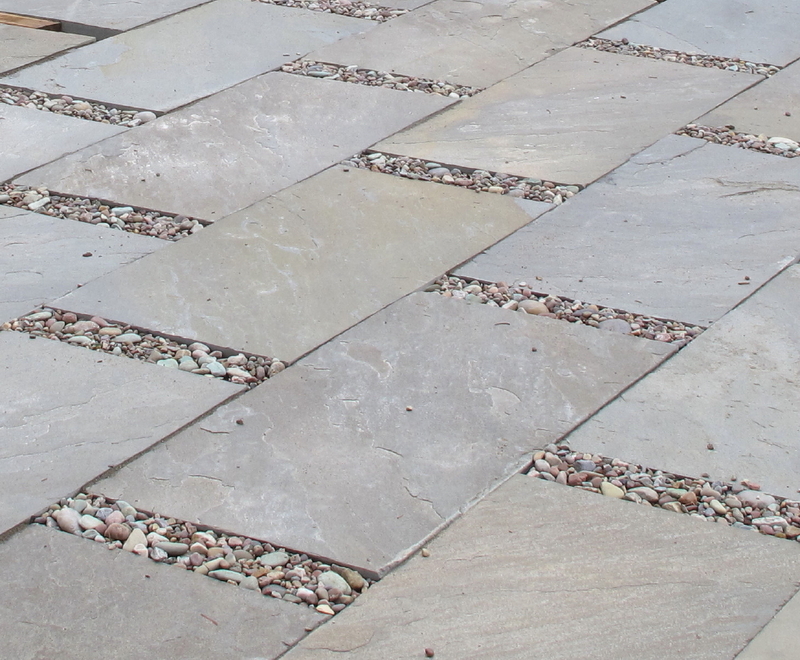 These give an informal look with the joints being filled with sand, groundcover or mortared. There is also a polymer available for this purpose which looks like sand but when misted with water sets up hard, making an effective weed barrier. Dimensional stone is natural stone which has been cut to specific sizes by machine such as 12” x 12” or 36” x 18”. With many sizes available you have the ability to design intricate patterns or to keep it simple. 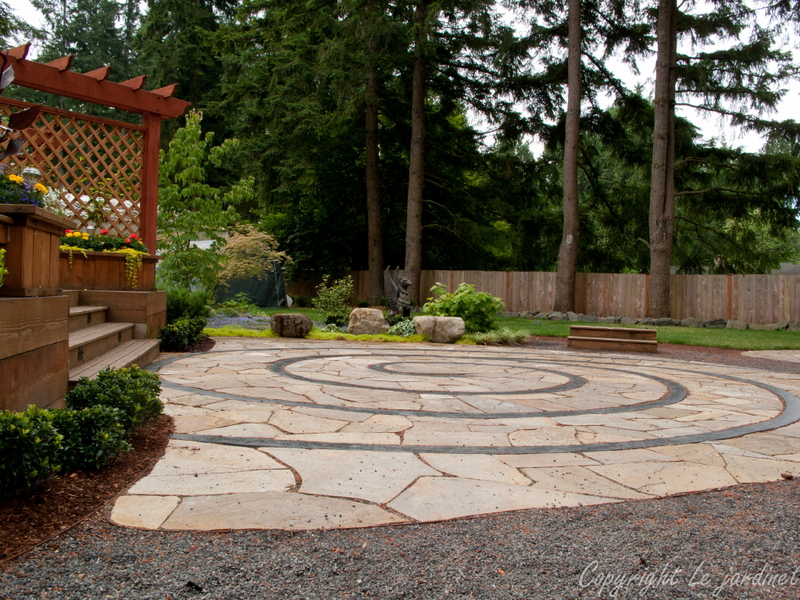 Many stone yards have free design sheets to help you select a pattern and calculate how many of each size you need. Brick needs to be frost proof to be a suitable choice for a patio in colder areas so check your source carefully. They blend well with traditional architecture yet seem equally at home in a more informal setting. Shady courtyards immediately come to mind, graced with clipped boxwood edging symmetrical borders, brick pathways and stone benches, perhaps with black wrought iron railings and a central fountain. There a timeless elegance about such a composition. Checkerboards, herringbone, fans, circles, squares and rectangles are just a few of the possibilities. The individual units can be set close together or spaced with more significant joints. 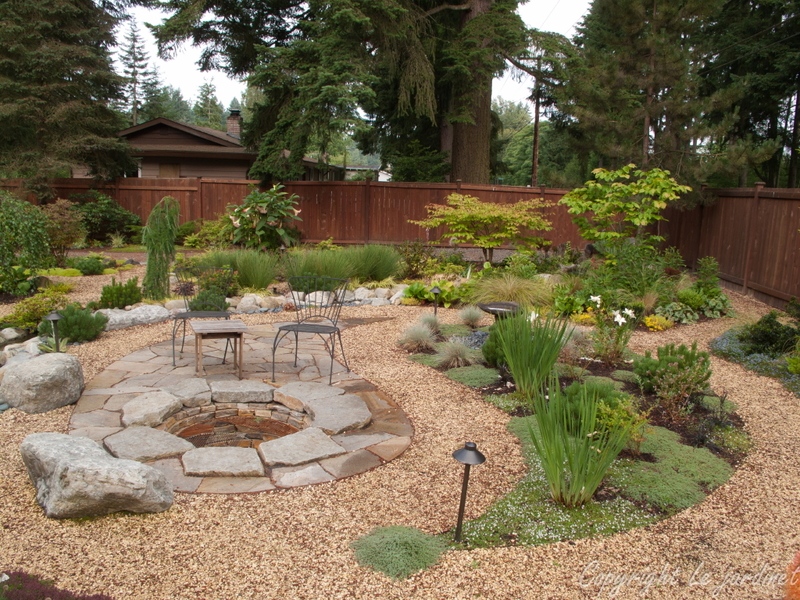 Sand, mortar, decorative stones, groundcovers (e.g. moss, thyme, blue star creeper, grass) can all be used to separate the blocks, adding both texture and interest. creates a welcoming space for this community center. Patios are set at ground level rather than raised like a balcony or deck but that doesn’t mean it has to be completely exposed to the rest of the garden. Partially surrounding the patio with a raised border provides a sense of enclosure – important in a large garden but equally inviting in smaller spaces. I think of these as ‘arms’ which wrap around the sitting area. Planting these with lavender or other fragrant plants adds an additional element to the experience. One alternative might be to surround the patio with a grove of trees which act as pillars and give a sense of place. Pergolas and gazebos can be added overhead to add vertical dimension, provide shade, create interesting shadows or simply make more of a statement. 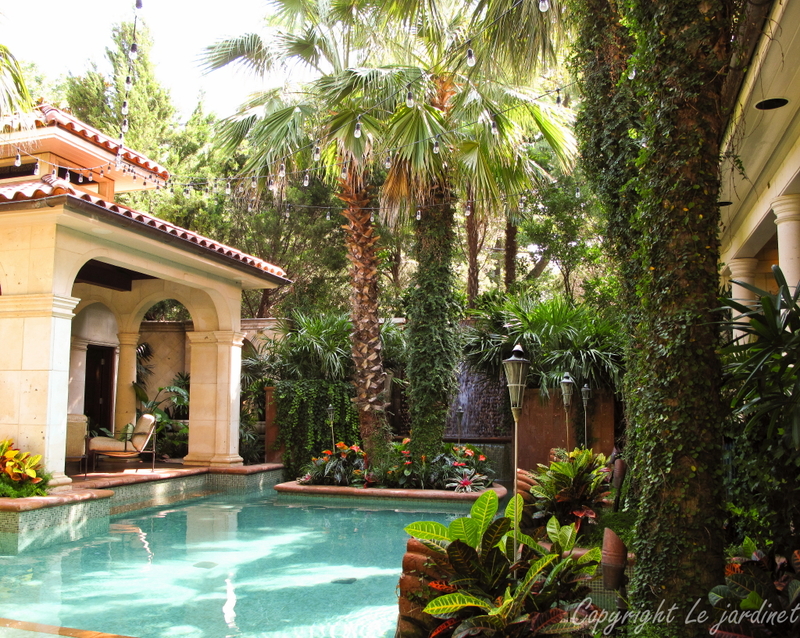 These may be over the entire patio or just one section, suggesting different rooms within the single space, each with a unique function such as dining and lounging. Containers – bring the garden onto the patio with colorful container gardens. Match the color scheme to that of your soft furnishings. and a stone patio with a pergola overhead for shade. Fire pits, hot tubs, pools, outdoor kitchens and built in seating can take a simple patio to the next level, transforming the space into a four season destination. Look at your existing patio and see if there is a way you can enhance it to make it more inviting and extend its usefulness. If you are about to embark on such a project (as we are) spend some time brainstorming different ideas to ultimately create something not just functional but is an expression of who you are. Thank you for an excellent post and some outstanding points. I agree with the article that patio requires a perfect designing in order to provide us the best place where we can relax with our family members and friends and thanks for giving patio designs ideas. Patios are set at ground level rather than raised like a balcony or deck. Thank you for stopping by - I'm so glad you anjoyed this post.